Dedicated Magazine April Issue #9 Features Detroit Area artist Mary Iverson. It is a celebration of hats and head-coverings. Decorative hats, ethnic head-wraps, floppy hats, fascinators, helmets, and even our special list of 25 Top Hats of all Time are all in these pages- a great finishing to our coverage of Spring/Summer Fashion and make-up trends. 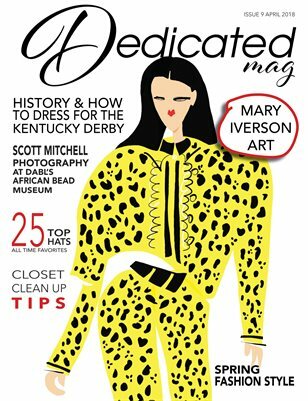 Look for the D logo for Tips and Tricks to styling for Spring/Summer/Derby events. Stroll through our many page salute to one of America’s favorite days to wear a hat Kentucky Derby, as you learn more about the races history. Stunning photography by Ashley Anger at Ferris Farms, in South Lyon, features fashions by C. Creations and Derby Hats by Rachelle. Our Mission to You (our Readers)... Inspiring a community through the journey of fashion, individuality, and culture by helping each individual feel confident to conquer the world we live in today!